@GamerChick42: Amarr and Minmatar join Forces to Kill Noir. 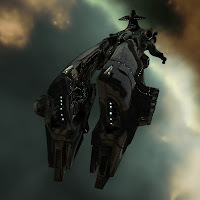 Amarr and Minmatar join Forces to Kill Noir. It started off as a shiny Noir. Navy Megathron sitting on the low-sec entrance to the militia warzone. You could sense the ripple of anticipation that went through our very bored fleet. Hans Jagerblitzen wasn't joking when he said that "most of us that fight in lowsec are like roaming packs of dogs." We were practically drooling. Suddenly, people were alt-tabbing back to game to see what was going on, and pausing from their mind numbing shooting of random POCO's in system. "They haven't jumped yet." our neutral scout said. Our loosely assembled and mostly afk fleet started to wake up, and we were quick to get people on the gate to get points in the event they jumped in. However, our neutral scout reported that more Noir. were showing up. A quick ship scan of several of their ships showed close-range buffer setups. "There's no way they'd bring that without logistics. They must have caps on standby." Late Night quickly started to reship into battleships and called on other Minmatar to join us. The fleet quickly grew, mostly comprising of Late Night Alliance members, and Iron Oxide. Alliance members. As we saw the numbers continue to grown for Noir., Sigma Pi, our FC, also commented that he was going to batphone. It was looking like even with the exapanded group, the numbers fo those Xing up in the needed BSes was looking a little tight. We kept eyes on the Noir. gang as they came into Huola, and went through to Kourmonen. We had been wanting the fight to take place there, and sent out a sacrificial aggression trigger -- Vordak Kallager in an Abaddon. As soon as he arrived on gate, they started jumping out, and it soon became clear that the fight would happen in Kamela instead. By the time I got across Kourm and into Kamela , cynos had already been lit and there were caps on field from both sides. The Minmatar fielded two Archons (Zenton Karvash and Late Night Alliance's Leader, Silence iKillYouu) as well as a Revelation flown by Kobal Nerios (aka M0220H). The Noir. capitals consisted of two Archons and two Thanatos. 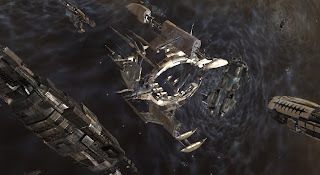 The Amarr set up in a sniping position on grid in a contingent of Tornadoes and Scimitars, completing the combined Militia forces. Galdornae loosely started to organize neuting on the hostile caps. It was somewhat amazing to me that a force comprising of the right combination of energy neutralizing power, dps, and logistics had been thrown together so quickly by militia. We're not always that fast to form, but everyone seemed to fall into the roles that were needed as if a capital battle was a second nature occurance. It was like some sort of light switch had been turned on. One by one, we capped out their carriers. Galdornae kept tabs on who was capped out, signalling to Sigma Pi, our FC, appropriate capital targets that were dead in the water. In the end, we took out all four of Noir. 's carriers, while losing none of our own. We also got through their triage reps to take down a Dominix and a Megathron, as well as the the shiny Navy Megathron we had previously been drooling over. "Hans Jagerblitzen has been Assassinated"
Minmatar losses were minimal, comprising of Vordak Kallager's Abaddon, and Hans Jagerblitzen's Typhoon Fleet issue. The Battlereport is here. At the news of who was killed on our side, there was, of course, some joking about Hans's 'assassination' by Noir, and we all had a good laugh. "Noir. are good pvpers, and we just obliterated them." Someone piped up on coms. "Yeah, that was a good fight." Someone else said. "However,.....perhaps they underestimated us a little." 'Twas a good fight guys! Late Night Alliance impressed me. A corpmate of mine and I were roaming by in a Thrasher and a Coercer when we encountered the Noir. fleet. We ran off, but after we saw you charging at them we joined in the fray. It was a great fight and tons of fun. 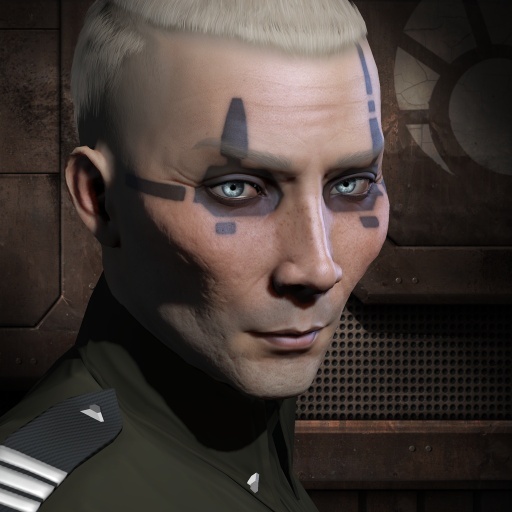 Apologies to any Amarr I may have shot before receiving the intel that I was not supposed to. It doesn't look like I killed any of them at any rate. Anyone else see some irony here? A bunch of Amarr ships flown by the Minmatar militia - and a bunch of Minmatar ships flown by the Amarr militia. WTF? Good grief. Those carrier fits, what is this I don't even. Fraps by Wayne Xiro, he put in some wub wub and timed it so its epic. Hans gets slaughtered in this battle. But he'll be doing the slaughtering come election time. Watch out Alek! Of course, I log on to have everyone laugh at me, as I'm infamous for getting in pod the moment AFTER an epic battle.